What's the liver all about???? Today was an amazing day. Peggy Black brought her "Team" of Celestial Guides to our Sacred Commerce group. 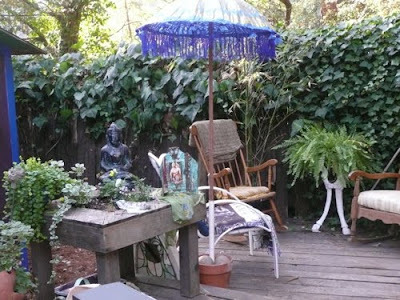 She did a reading for the group as a whole, talking about the tapestry we are weaving with our soul connections, and the work we will do collectively and individually.... maybe even a collaborative book! Then she "read" each of us.... rather, she allowed the Team to speak through her. Each of us was moved and validated for information and knowledge we already (kind of) knew. For me, she validated that this is a time of going within and simplifying my life. They talked about our property and the healing nature here. They asked for a name and instantly the name "Chrysalis" came out of my mouth. Appropriate. A time of being in the cocoon, preparing for transformation. So, part of being in the cocoon, for me, is about doing the deeper work I've mentioned before. Entering the Castle has me searching out "deep stuff" in rooms filled with grief, shame, loss, and sadness. Who want to go there! But it's a necessary journey, into the dark night of the soul. The Team picked up energy around my liver. Louise Hay says the liver holds anger issues. I think the liver is about cleansing. I don't relate to the anger part. Yet, I'm open to the messages that may be lurking in the darkest corridors of my Castle/Liver. My friend Maja speaks of living in the mystery. That's kind of where I'm at right now. It's all a mystery. I'll be starting classes next week, working towards a degree in "Expressive Arts Therapy". As for starting up new business, developing new groups or attracting new clients... well that seems to be on hold for the moment. It's not the time to start something new. When I'm ready.... well, wow. I can feel it and see it. Just not right now. In the mean time, I'm curious about what my liver has to teach/show me. I welcome any insights concerning the metaphysical aspects of the liver. I listened, all night, to the Abraham CD "Think and Grow Thin".... woke up this morning hearing the message about not fighting the river... not paddling UP stream, against the currant, but rather to go with the flow, not even needing to paddle down stream. The Law of Attraction is all about allowing. Allowing is about flowing with the currant, down stream... about aligning my thinking with what it is I DO WANT. I've been doing some really deep emotional work this week and it's been showing up in aches and pains in my body. I even fell, plus a cabinet glass door fell on my head! That's what can happen when you go deep into the darkest Castle chambers! But, today was different. Every thought is one of two things: an up stream thought, or a down stream thought. That simple. So today, I watched my thoughts. I purposefully replaced "up stream" thinking with positive, down stream thoughts. Instead of thinking about how my body was aching and stiff, I thought about how lovely it feels to stride in big swaying steps. I thought about how wonderful it feels to have a spring in my step. Literally, as the day went on, I felt more and more limber in my movement. So, Abraham's words are still sinking in. Oh... it was also very easy to stay with my food plan today. Didn't want to over eat or even snack. Another nice thing to be grateful for. Well... I finally figured out why my camera wouldn't load pictures to my computer... so first thing this morning I have to post the awesome views that wake me each morning! Taken right about 8:30am. I've already been journaling and meditating before I thought to capture the view. While I am doing some deeper soul work (Entering the Castle, by Carolyn Myss) I am held in the gentle loving container of this Zen Garden. I leave my garden to "do my day", but many times a day, I return to it's beauty. You can see the sun light filtering through the Redwoods. 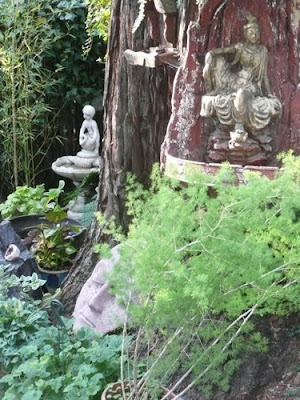 Quan Yin, up close on the right, was found in a garage sale more than 15 years ago. We love her and she has graced every home/garden we've lived in. This is a planter my son Tim made, planted with tiny baby plants which will fill out in time. 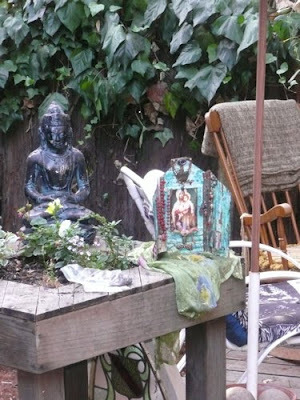 You can also see another Budha statue, plus my altered art shrine. Here's a long shot of the left side of the garden. The ceremonial umbrella came from Bali about 11 years ago when I was honored to travel with Soul Sister Toni! Bill and I found the little boy fountain way in the back, about 17 years ago. We gave it to my dad for his garden. Now that dad has passed, it has special meaning to me, knowing my dad enjoyed seeing it through his kitchen window every day. 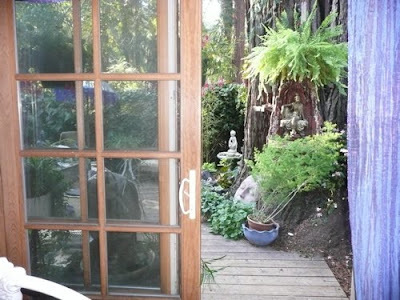 Want to come visit in my Zen Garden? Tea is lovely. Sometimes just sitting in silence is wonderful. So, today, in our Sacred Commerce group we went on a magical, angelic guided meditation. And OH WHAT A DREAM! Our guide, Denise Linn, took us into a beautiful domed structure (mine had deep blue painted ceilings with gold woodwork)... the center of the dome opened to the sky where suddenly a sweet little cherub face peeked over the edge! Straightaway we were swarmed by hundreds of the sweetest, most adorable, little angels, all laughing and giggling like happy, delighted children. MIRTH! The angelic cherubs romped and danced, soared and swirled all around us for what seemed like a life-time, yet passed in mere minutes. I'm still smiling and still feel the tingles of joy and delight. Do you know, those little celestial beings stayed with me all day! They accompanied me to our old house and made the chore of cleanup, organizing, sorting, etc.... all go happily and smoothly. This was a dreaded, heavy chore! But my little companions made light of the work and actually had Bill and I being silly and having fun to boot! So I invite you to go into your heart, find that special domed shaped chamber, and invite these tiny Celestial Angels into your life. Why not have some fun. The lovely sound of trickling water is lulling me softly this evening. I am aware that my angels and guides are surrounding me with love and light. They are right there, just waiting for my attention so they may facilitate my intentions. I don't feel like I've been paying attention nor setting my intentions these past couple of days. I've just been floating along. No, wait, that's not true. There are several things going on, some that pull my attention and others that allow me to just float along. So it's been an interesting adventure this weekend. Bill and I puttered in our Zen Garden and constructed three water features, plus placed a huge rock (I forgot it's name). We've also been at the old house and, truthfully (ouch) I'm a bit overwhelmed. I'd much prefer to continue to feather the nest here, to create sacred spaces to enjoy daily. This afternoon Bill pulled out boxes and boxes from the attic. Papers and memorabilia from the 60's... my exhusband's sailor hat that he threw to me as he was leaving for Viet Nam. My son's Evilconeval costume, Ernie and Burt hand puppets, old jewelry boxes, my dad's taxes from the year he died. There is just so much stuff to be gone through. So, I'm asking my angels and guides to help me set my intention to have this be a light and easy adventure. It is my intention to breeze through the rooms of boxes, books, clothes, etc.... setting aside the keepers and letting go for sale so much more than I'd planned. We just want to be "done" over there so we can sink in to the beauty, peace and serenity here. My angels and guides are pretty cool, so I know this will be done. Allowing is so much more fun than controlling! And that's the truth! There was nothing in the world I could do or say to change the frustrating behavior of the cable company.... it was what it was.... and eventually, it did get fixed. There I was in the middle of one of my own lessons: I could let my self get anxious and stressed, or I could allow myself to flow with what ever. Well, I know there's a middle ground, I and think I'm getting closer to recognizing the choice point... sooner! So, I've been playing observer, watching my Self through these last few days. I have re-experienced some of the stress I left behind months ago. Difference is, my angels and guides have been right here, tugging on my sleeve to get me to see the bigger "allowing" picture. Hmmm... isn't it interesting how we read/see/hear just what we need WHEN we need it!! It was challenging to stay in an "angelic" frame of mind today. The cable/phone company kept me on the phone for almost three hours total, in four different conversations. The child in me was so upset that she didn't get her quiet time. The controller in me was upset that I couldn't control the mistakes they kept making. The caretaker in me was frustrated because neither the shop, Bill, nor Brit could reach me when they phoned. I was spinning. I was watching myself. I caught myself from falling over the edge. So I just stopped. Tomorrow is another day. At least one phone line is working. I didn't really lose it. I don't have to be in control. I just like it better that way. It was an interesting and amazing morning. My sweet Sacred Sisters met with me for our Sacred Commerce group. We've decided to call this Level IV.... Peggy Black's talk last week about partnering with your Celestial Guides really took us to a new level. It feels like it's the missing piece... to fully engage the power, protection, and Divine Guidance of our Celestial Guides. Peggy calls them her "Team". No matter what "they" are called, they are ready to be at our service, if only we make space and call them in. 2: for guidance and direction to make myself available to do the work I was brought here to do. I agree to work in partnership with my spiritual guides. I agree to show up and be accountable. I agree to be conscious of their direction and influence. I agree to allow full support. I agree to place myself under the Law of Diving Guidance and Divine Protection in all situations, time frames, and realities. I agree to be about my Divine Purpose. I agree to be a clear channel of Divine Light and Divine Love. I agree to follow the Divine Laws of Attraction. I acknowledge my Divine Troop of Celestial Angels and Guides are ever present and available to me. And so it is agreed. Well, I've continued to be in some sort of altered reality this week. I'm here and present, but also kind of empty in my mind. ?????? Maybe after ten years of pressure and of being overwhelmed and having to work 60 hours a week, I'm still in shock at the unpressured state of being today. Then again, I've also dramatically altered my state of thinking to allign with the Law of Attraction. When I am now confronted with what would have made me frustrated, tense, pressured, etc... I an conscious to choose another way of thinking, another way of holding the information. So maybe it's the absence of all the stress and anxiety that manifested a great deal of mind and time. I believe I am recalibrating to living with more "roominess" mentally, emotionally, and spiritually. The biggest thing that is going on for me this week is about connecting to my angels and guides. More and more I am finding their interventions in my life. And through unexpected sources. Yesterday my son was imploring me to return to a regular diet regiment such as OA. He expressed his desire for me to be around for a long time. And he said he was going to call me each day to get my calorie count. (Something my OA sponsor would do.) It touched my heart and brought out tears. Such a sweet way of showing that he cares. And there is more to that story.... more about making that deeper connection to my son. But, see... I can't think of any words to share about that. It's just a feeling of deepening and soul joy. My morning Essene meditation said something about my inner monk that keeps me centered in my castles of love and that I am empowered by that Chant within. So, I'm taking more quite time now. "Little things" to "Sacred LIttle Moments"
It's the little things. I often allow little things to get me... to lead me into frustration and dense energies. I don't want to say "It's ALWAYS the little things" because I don't want to program that thought into reality. I didn't sleep well, even after an amazingly beautiful day yesterday. I enjoyed my Zen garden from my bed until 11am! Unheard of from me. It was so beautiful! I even downloaded some fabulous Zen flute music to accompany the essence of the garden. Bill and I had a lovely trip to Watsonville. I listened to my Angels and found amazing tomatoes for 10 cents a pound! (Yes!) 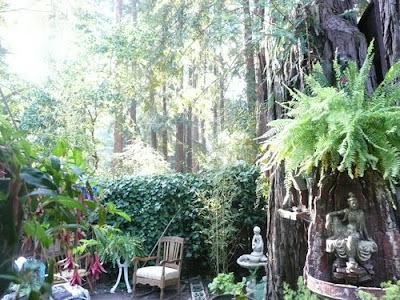 We put down Redwood bark chips and the surrounding areas help to create even more serenity, peace and calm in the Zen Garden! So, I was feeling quite peaceful when I went to bed and was about to blog about the day.. when my cable connection to the internet was lost. Second time in two weeks. Plus the new "bundled" cable phone line cuts out like poor cell phone reception, but only at night. So, rather than deal with it last evening at 9pm, I took it to bed with me. Unrest was in my sleep and dreams. I even told myself that I could use this opportunity to practice the Law of Attraction... I could be agitated or relaxed and peaceful. In the end... my reframing it helped me correct the issue first thing this morning which allowed me a little time to meditate, journal and blog. I corrected the problem by unplugging everything and rebooting the works. So, now I set my intention to reframe my attitude today. Instead of being tired from restless sleep, I am open to the flow of the day. I am open to the love and care of my angels. I'm busy today, all over town, bank, antique store, etc. I intend to take the visual, audible, sacred essence of my Zen Garden with me to enjoy in sacred little moments through out the day. Hey! I transformed "little things" to "sacred little moments"! Thank you Angles and Guides. My JUICY SACRED CREATIVE ANGEL! I am still moved to speechless from the Holistic Network meeting on Friday night. At first there was this inner push to figure it all out. To write profound thoughts on the subject of my Angels and Guides. So I have. Not that I've stopped my "doing" around here... the Zen Garden is looking really lovely. What I'm relaxing is the push, the effort in my mind. I keep saying it sounds silly.. an angel guiding the creation of my sacred spaces? Yet, the whole painting party was so quickly inspired (and almost completed!) there seems to be an energy that keeps propelling the creation of this space, and of our home! Silly-Sacred.... actually, sounds allot like JOY, light heartedness, peace, smiles, open heart, comfortable, welcoming, ZEN. Thank you Mother-Father God... THANK YOU! my Juicy Sacred Creative Angel!! !